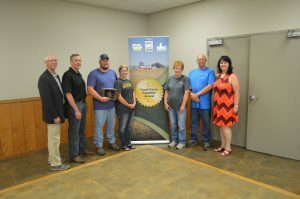 Young Calhoun County farmers and pork producers have become the 138th recipient of the Wergin Good Farm Neighbor Award. Steve Moline, division administrator for the Iowa Department of Agriculture and Land Stewardship, presented the award to Jason and Gene Folsom on Tuesday, June 19, at the Expo Center on the Calhoun County Fairgrounds in Rockwell City. The Folsoms raise hogs on contract for Hanor on four different sites in the county and also grow corn and soybeans. In addition to his work on the farm, Jason also is active in his community, including serving on the Calhoun County Farm Bureau Board of Directors, as well as being a district representative for the Iowa Corn Growers Association. Iowa Secretary of Agriculture Mike Naig was unable to attend the event, but congratulated the family on the award, named after the late WHO farm broadcaster who helped create the award. “Animal agriculture is so important to our state and adds so much to rural communities. It is an honor to help recognize our farm families like the Folsoms that do such a great job caring for their animals and protecting the environment, while also being active leaders in the community and helping feed the world,” Naig said. The family was nominated for the award by Darcy Maulsby, a friend and fellow Calhoun County Farm Bureau Board member and Calhoun County Corn Grower member. Maulsby highlighted the family’s commitment to caring for their animals and the environment in her nomination. The “Big Show,” which airs on both WHO and WMT radio, did a live broadcast from the presentation. About 75 friends, relatives and neighbors attended and enjoyed fellowship and a free pork lunch. Folsom said it was exciting to learn of the award and be the second winner in the county.